Review of Breckenridge SummerBright Ale | Beer Apprentice - Craft Beer News, Reviews, Interviews and Info. How is it going out there today guys? Hope all is going well. It’s time for another craft beer review!!!! 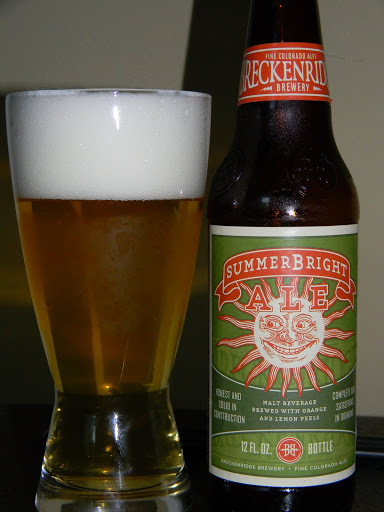 Today I am going to pour a glass of the Summer seasonal from the Breckenridge Brewery called Breckenridge SummerBright Ale. The brewery is located in beautiful Denver, Colorado. They produce several different types of brews for all occasions and I have found that I tend to like the Breckenridge Brewery line of beers pretty well, however I have never had the SummerBright Ale, so I’m looking forward to sampling it. Here’s the description I found of the SummerBright from the website, breckbrew.com. The brewmaster’s goal: the perfect ale for summertime quaffing, nothing more. Breck Brew’s SummerBright is the result. The craftsman’s touch combines white wheat, two row pale and munich malt with the pacific northwest’s most intriguing hops to create a bright, clean ale ideal for picnicking, evenings on the screen porch and enjoying the whims of the summer breeze. Sounds good. Let’s see for ourselves!!! This beer poured from a 12 oz. bottle and had an ABV of 4.5%. With an aggressive pour, this beer appeared a very clear, yellow/gold color. A very bright white, soapy, fluffy head was produced that grew to a nice size and it actually stuck around for a few minutes. The lacing was adequate too. Not the best, but it was ok.
Once I got a nose on this beer, some clean and fresh lemon citrus greeted me with enthusiasm. Touches of orange peel were detected along with some wheat and grain notes. The hops were kept at a minimum and a faint biscuit malt started to arrive after it warmed a touch. I thought I may find some spices in the aroma, but I didn’t really discover any. Aside from the lemon citrus, the bouquet seemed somewhat restrained and laid back, however is was balanced ok and not too complex. The taste brought out more of the lemony citrus with the orange zest. A crisp, cracker and biscuit malt complimented the sweetness and helped tone down the tartness of the fruit. A mild hop bitterness was encountered, but a grain-y undertone started to overtake any sort of offensive “bite” that may have occurred. Again, no distinguishing spices were to be found. The profile was moderate, kind of sweet and well balanced. The mouthfeel was mostly medium, yet teetering on medium/thin. Crisp, smooth, refreshing and thirst quenching. It began relatively dry, but started to get a tad watery as I got closer to finishing the drink. A touch of flavor was left on the palate, but not much really. This is a pretty good representation of a “Summer” beer in my opinion. It has all the proper characteristics. It’s easily drinkable, refreshing, clean and crisp. Not overly robust, which makes it perfect for those hot, humid days. A “lawn chair” beer for sure. I could see icing down several of these for the 4th of July weekend. Even though Summer seasonals are probably my least favorite of the seasonal styles produced, I do find myself enjoying one from time to time. Give this one a go if you are looking for a straight forward, decent, no-nonsense beer. Cheers!!! What is your favorite brew for Summer? Thanks for reading and commenting guys.